"That Aunt Cass, she's a giver!" Ella exclaimed when we received a recent package from my beloved aunt. Indeed, Aunt Cass is a giver. Over the years, she has given me three treasured nativity pieces, a beautiful candy dish and matching juice goblets, and many, many bottles of Watkins Double-Strength Vanilla. 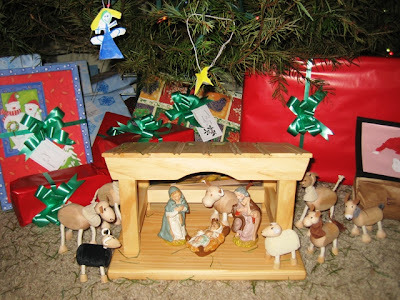 This year, she gifted sent us a large box with the makings of a Nativity Set. -- a stable that was built by my cousin Joe and a collection of Anamalz, small poseable animal figures made of sustainable maple and textiles. In her note, Cass commissioned us to find other pieces to complete the set. The girls were both so excited about it, and we got to looking around our house for ways to complete it. I decided that we would place the set beneath the tree since that is what my mom did with ours when we were children. Naturally, we also decided that my three nativity pieces that have never had a stable to call home should become a part of the set. Then, Ella got to work with her homemade ornaments and soon enough we had a star and an angel to hang from the tree. While we are still missing shepherds and wise men, I hope that over the years this collection can grow and evolve. Perhaps we'll make it a tradition to make some new "pieces" each year. Thank you for the memories Aunt Cass!